When a child or adult is bitten by a dog or attacked by another pet or domesticated animal, the owner of the animal may be held responsible to pay for the medical bills, any lost wages, physical pain and suffering, and any psychological counseling the victim needs. 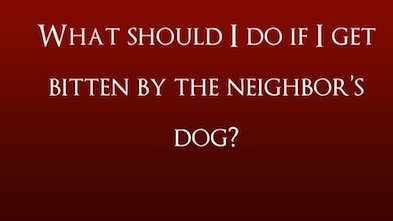 Dog bites and animal attacks may be covered by the responsible party’s homeowner’s insurance. Unfortunately, the animal’s owner and the insurance company may fight to deny the victim full and fair compensation for his or her injuries. At Bache & Lynch in Tucson, our attorneys understand how the insurance companies operate. We can act quickly and with determination to help you secure full financial compensation after a dog bite or animal attack resulting in serious personal injury or wrongful death. We are trial lawyers — we will fight for your recovery in court, if necessary. Contact us today for a free consultation. The American Medical Association reports that dog bites are the second leading cause of childhood injury, surpassing even playground accidents. According to the Centers for Disease control, the odds that a dog bite victim will be a child are greater than three to one. Children taken to the emergency room after a dog bite are much more likely to suffer injury to the face, neck and head. Dogs and other pets are not the only animals that cause serious injury. Many do not realize that, under certain circumstances, they may have legal recourse if they are bitten by a rattlesnake, javelina or another wild animal. An owner of a business or commercial property may be liable for failing to use reasonable care to protect guests from harm from wild animals, or to warn them of the danger. Failing to use reasonable care to prevent wild animals from having access to the patio of a restaurant or hotel, for example, may make the business liable for any injuries that result. To discuss your rights and legal options after a serious dog bite or animal attack, please call our Tucson personal injury law firm at 520-293-5300. You may also contact us by using the Contact Form above for more information or to schedule a free consultation. Please continue reading for useful information regarding preventing animal attacks.